You may use and, or, and not. Click Image for FREE PDF! 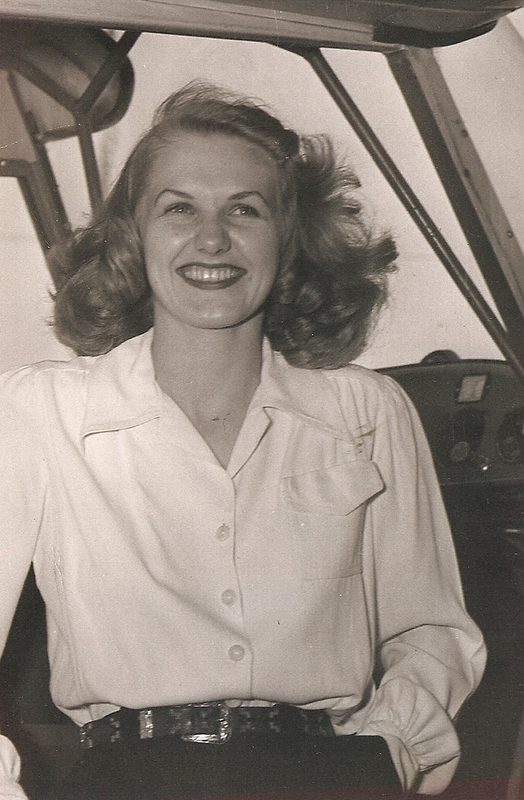 Patricia completed a Bachelor of Science in Aeronautical Engineering in 1950. She then when to work at North American Aviation as an aerodynamics engineer, raised four children, and resumed her career as an aerospace engineer for the Navy at Point Mugu. Listen to Patricia talk about her childhood obsession with flying and how that led to her choice of career as an aeronautical engineer. PP: ...the Depression came along soon after so they were not only young, they were pretty poor. But I grew up...I was born three months after Lindbergh crossed the Atlantic solo. I don’t know if it was a pre-natal influence but I knew I was fascinated by airplanes from as far back as I can remember. I remember vividly being about five years old and getting the bright idea, “Hey, I’|l put wings on my tricycle so I can fly" (laughs). I had some...my grand-dad was putting shingles on the roof at the time and there were some boards and nails and stuff and I picked up a rock and was trying to put wings on my tricycle and then all of a sudden it struck me "Hmmm this is never going to work." And I kind of remember that as the moment when I crossed that line between being a child and being an adult. And I realized that there was a lot more I needed to know before I could fly (laughs). KW: Did anyone in your family...what did your parents do? Did they have any connections to flying? PP: No connection whatsoever. I just had that strong urge and I started working when I was about twelve and saving my money and when I was sixteen I went out to our little airport out on the edge of town and signed up for some flying lessons. This was still during World War II so to take flying lessons I had to join the Civil Air Patrol, which was fine with me. I learned a lot of neat stuff. But it was kind of like the more I learned the more I wanted to know. And flying was great and I loved it but I really wanted to learn everything about airplanes. I didn’t know that wasn’t quite possible but I started pouring over the college catalogues and the only thing I saw that had anything to do with aircraft was aeronautical engineering. I had absolutely no clue what that was. I’d never known an engineer. I’d never heard of an engineer except for the locomotive engineers. But I decided that that’s what I wanted to study. KW: I just wanted to ask really quickly, when you were growing up how did your family react to your interest in flying? Were they supportive when you wanted to go take flying lessons? PP: By the time I was signed up for flying lessons I had already figured out that it’s better to ask forgiveness than permission (laughs). I had parents who were very, very protective. They wouldn’t even let me go skiing, so I knew if they wouldn’t let me ski, they certainly not give the okay to flying. But once they found out I was already doing it, they were supportive. I think they might even have been proud. But when I announced that I had decided that what I wanted to study was aero engineering my Dad just kind of exploded and then came out with at very rude comment like "You are not!” (laughs). Mother was supportive. She wanted me to go to college. She tried to talk me into doing something practical like, "You could be a flying secretary (laughs). And I thought "Oh yuck!". And of course everybody suggested that I be a stewardess and that was not what I had in mind at all. I wanted to know all about airplanes. So, by the time I figured out what I wanted to do, it was really too late to apply for a scholarship. I had good enough grades in high school that I was offered a scholarship at a couple of small colleges in Michigan. KW: You grew up in Michigan, correct? PP: Yes, yes. About a hundred miles south and west of Ann Arbor. Anyway, I didn’t have any financial help. The best I could do was I worked all summer long and I made a deal with my Dad that if I saved up a $100...I think tuition back then was something like $60 for in-state students. I don’t know what it is now but $60 was quite a lot of money then. I was working. My summer job paid about $18 a week, I think, and I made a deal with my Dad, "If l save a $100 will you loan me some money?”. And he didn’t think I could save that much, so he agreed to it (laughs). So, for the first two years in school my Dad loaned me some money kind of grumpily but he helped me out until I guess the summer between my sophomore and junior years. I got a job down in Texas as a waitress on a dude ranch. Oh that was a wonderful summer. Had a great time. But anyway my Dad said, "That's it, I'm through, don’t expect any more help from me". So, I didn’t get any more help from him, so I stayed out of school for a year to work and save money and then I went back to school and got through another year, I think another year and half on what I saved. And then I got married and finished on the G.I. Bill (laughs). That helped me out quite a lot because I married a veteran and he was going to school on the G.I. Bill and they increased allowances for married vets. So, I got to finish on the G.I. Bill. KW: Well, that’s impressive how much you had to work just to pay for it. PP: Yeah, I worked all the way through school and I kept working after we married. also. I started out working in the dormitory where I lived and that was kind of my social time. That was where I would see my friends who lived in the dorm because I was very busy studying the rest of the time. And I didn’t have the advantage of having other engineers in the dorm. KW: Right. Did you live with women then? PP: Yes. It was all strictly separated in those years. Although I did have...I don’t know whether it was the second or third year in school...I did have a roommate who also an engineer. I think she was the country’s first female naval architect marine engineer. She was a very interesting person and very into boats just like I was into aircraft. She was crazy about ships. KW: What was her name? PP: Her name was Audrey Muller. She is no longer living, she died a couple of years ago, sorry to say. But she was a very interesting person and we got along well. She went to Texas with me that summer too. She also worked on the dude ranch. Let’s see, where are we now? KW: Well, I wanted to ask you, what made you pick Michigan? You said you got some scholarships from smaller colleges. What made you decide to go to Michigan then? PP: It was the only place I could afford. I really did want to get further away from home like go to Pennsylvania or California. But also in those years not all engineering schools would accept women. But Michigan did and I don’t remember now which ones but I thought about Caltech and MIT and some other schools and I don’t remember now which ones would accept women and which ones wouldn’t. But that certainly was an important factor (laughs). Listen to Patricia talk about campus life and her favorite activities. KW: I wanted to ask you a little bit about your life as a student in general. You said you lived in dorms for some of the time? PP: Yes. Until I married I lived in Mosher-Jordan. KW: Okay, I lived right near there my freshman year. KW: I lived in Mary Markley. I don’t know when that was built. PP: I don’t think it was there...it wasn‘t there. There was Mosher-Jordan right next to Stockwell. And those were the only dorms up there and they were strictly women’s dorms. KW:	Were a lot of your friends then...well, who were you friends with because you wouldn’t have had a lot of women in your classes, correct? PP:	Right, there weren’t any women in my classes. KW:	What were most of your women friends studying, to become teachers or...? I’m just curious. PP:	I don’t remember particularly except for my naval architect marine engineer roommate and she did go on to a very satisfying career. She started working after she graduated and kept working until just a few years ago. But I don’t know, I didn’t have any really close friends. I had a lot of acquaintances. But I was very much occupied between working and studying. I didn’t have much socializing time. That was one thing I liked about working there in the dorm cafeteria because I would get to see my friends and chit chat and that was sort of a relaxing time for me. The rest of the time I was working pretty hard (laughs). KW: Right, right, I can imagine. That kind of leads into my next question. I wanted to ask you what you did on weekends or days off if you did have any time off. Any particular hobbies or memories of things you enjoyed doing come to mind? PP:	Oh I enjoyed the Arboretum. I loved to go walking in the Arb and would lots of times study there...take my homework and go sit in the Arb and read a book or whatever I was doing. In the winter time I liked to ski there. I really pretty much had my nose to the grindstone. I read a lot. I took advantage of the library there in the dorm to study some things I didn’t have time to take courses in. I was interested in philosophy and religion and learning more about psychology. So I did a lot of just reading on my own in other subjects. KW:	Were you involved in any clubs or organizations while you were on campus? PP:	Not really. I did have some association with the Women Engineers. I thought that would be a good idea but I didn’t really get very involved in it. I didn’t find enough reward in the time spent there. They were just sort of fawning around trying to get organized (laughs). I wasn’t really a joiner or in the clubs. So, I didn’t really have much association with them. Listen to Patricia tell the story of how her husband finally got a first date with her. KW:	Did you go to football games? PP:	Oh yes. I certainly did. KW:	What were those like? PP:	Oh it was a lot of fun. I particularly remember the football games after Hank and I married because then we had an apartment and I’d put a casserole of Sloppy Joes in the oven before we’d left and have everything ready, so after the game all of our friends would come back to our apartment for a Sloppy Joe supper (laughs). He was very social and he had belonged to a fraternity and he had a lot friends and his friends became my friends because I was very quiet and studious and didn’t socialize much until I got mixed up with him. KW:	So, he came to U of M on the G.I. Bill? PP:	Yeah. He wasn’t there my freshman year, the war was still going on. But the war ended between my freshman and sophomore years and he was one of the G.I.s that came back to school in that first rush after the war ended. So, he came there in the fall of '45 and he was in my chemistry class and we were in the same lab group. We laughed about this for a long time. He kept asking me out but he would wait to call me until just a few days before the weekend and because I was one of very few women there in engineering, I had lots and lots of offers (laughs). And by the time he’d get around to asking me out, I'd already have a date (laughs). So, it wasn't until New Year's Eve of '45-'46 that we finally had a date. And I had a date for that New Year’s Eve but it was with one of his fraternity brothers, which I didn’t know at the time. But the guy I had a date with was in an accident over the Christmas holidays, so he didn’t make it back to school. So, Hank knew that the guy had been in an accident and wasn’t making it back and that he had a date with me for New Year’s Eve, so he called me up and asked me out and that was our first date. KW: Oh wow. That’s funny. Listen to Patricia discuss how the end of World War II impacted her classes at U of M.
KW:	So, you mentioned a big rush, was there a lot a veterans all of a sudden coming back to campus? PP:	Yes, yes. That first year after the war a lot of veterans came back. Not all of them were let go right at the end of the war. Hank was in that first batch that was let out of the Army or whatever they were in, so he was back pretty early. But more continued to come back in the second semester that year and in the next year. And I remember an English class I had where they had a lot of...the whole back row was Marines from the South Pacific that they did not release. They made them stay in the service and they sent them to school and of course those Marines had no interest whatsoever in being in that English class. It was a speech class and as usual I was the only girl in the class. I was very shy. I embarrassed easily and it was just their delight when I had to get up and give a speech to sit there in that back row and heckle me (laughs). I remember thinking, “If l can get through this I can stand anything" (laughs). KW:	So, in a lot of your classes then did it feel like all of sudden several new classmates were coming in who were war veterans? PP:	There were more...the classes were all fairly large and all men, so I didn’t really notice that particularly except these were older students. They weren’t just the kids, these were older guys. We had Navy V-5 and V-12 there when I was there my freshman year, so we had a lot of those guys in uniform in our classes. And there were fewer in uniform and there were older ones. At least they seemed older to me. KW:	You mentioned that the war ended during the summer of your freshman and sophomore year. PP:	Yes. The Summer of '45 was when the war ended. KW:	Did you notice anything on campus? Were you in Ann Arbor, were you on the campus at that time? PP:	No, I was home when the war ended. KW:	What was the mood like when the war ended? PP:	Well, it was kind of funny. People were elated. We were staying at a cottage out at the lake and everybody went into town except me. I don’t know why but I didn't want to go into town and see what was going on. I guess I had worked all day and I just wanted to stay home. It was very quiet out at the lake. I don’t know what it was like in town, but I heard later that people were all excited and whooping and hollering and having a great time. But I had at quiet evening and that was when I smoked my first cigarette. I had to do something I guess to commemorate it and so I thought, "Well, I’ll have a cigarette.” My Dad was a smoker, so I got into his cigarettes and that was my first one (laughs). It was kind of dumb. It was a few years before I realized what a dumb thing I’d started and I was smart enough to dump that habit. But I went through it. KW:	Hey, it’s a funny memory, a good one to share. Listen to Patricia describe her interactions with her male classmates and professors. KW:	Well, next I just wanted to ask you a little bit about your classes. So, what was it like being the only woman in the class? How did your male classmates treat you? PP:	Well, I got a lot of attention. I certainly was noticed by everybody. I remember, I guess it must have been the first semester, having to walk down a long hall to get to the end of the line for signing up for classes. They did it differently then, we didn’t have computers. We all carried slide rules. I remember getting whistled at and ogled and just being embarrassed (laughs) but realizing that well if that’s what I wanted to do, I was just going to have to take it. I did get a lot of attention, a lot of requests for dates, and it was something I just had to learn to deal with. KW:	Did you get any attention, you know, classmates wondering "why are you here" or “this isn’t your place”? Did you get any of that kind of attention or was it mostly “do you want to go on a date"? PP:	It was mostly "do you want to go on a date". I was young and shapely and long blonde hair and I did get favorable notice. And I didn’t get any of the "what are you doing here” kind of thing. Some of the professors took that attitude. But there were also other ones that were surprised to see me there but it was all right. Occasionally, I would get one that would be particularly helpful because I was not as well-prepared as the guys were. When I went to high school all girls had to take home ec. (laughs) and no girls were allowed in the shop or even in the mechanical drawing classes which I think was just a terrible handicap for me because that was my toughest subject was the engineering drawing. I was not at all sure I was going to be able to get through that one. I did, I made it but very badly (laughs). But I did get through it. But I was well-prepared in math and science because those had been the classes that I had been interested in. KW:	I know this kind of goes back in time a bit, but did any high school teachers, were any of those particularly encouraging or influential for you? Or were you kind of motivating yourself? PP:	Well, I was very strongly self-motivated but I did have an excellent math teacher who considered me his best student and was always very supportive. He was given a class to teach for...they called it a pre-induction course in aeronautics that was supposed to be just for the guys. And I asked if I could take it and he was very happy to have me in the class and I was the only girl who took that which was kind of good for me to get used to being the only girl (laughs). KW:	How were professors then? You said some here helpful, did you ever encounter any really negative or disapproving professors? PP:	Well, I just have to chuckle because there was one little old guy who was Scottish and he taught metal processing. And this was a class where we had to make like a blacksmith and get our metal hot and then bang it with hammer to shape it into something. And I didn’t have the strength to do that and it was just ridiculous. And he'd walk over and scowl at me and mutter under his breath and then he would take my hammer and the piece I was working on and he'd give it a few good licks and then hand it back to me. And then I would end up getting an “A” because he had done all the work (laughs). I always laughed over that. He was very grumpy to me, very gruff, but he kind of reminded me of a grandfather I’d had that was kind of grumpy and gruff and played tricks on me. KW:	So, that’s good. A couple of women I spoke to mentioned that they had professors who would say things like, “If you take this class. I’m not going to pass you," so they would have to transfer to another section of the class. You never encountered that? PP:	I never did. I think when I went there, I think there had been so few women come in that they had not gotten defensive. There were like 3500 or so in engineering school at the time and twenty of us were female. I did one time encounter one other girl in a class, but usually I was the only girl in the class. And they would mostly just ignore me and I was happy to be ignored. I’d kind of come into class at the last minute and slip into the back row. Never raised my hand. KW:	Since you went into college knowing that you wanted to do things with planes, were the classes that you took, did you feel that they were helpful, that they related to what you knew you wanted to do? Or did you find them meaningless. not very useful? PP:	Oh most all of them were things that I wanted to know desperately. I didn't really know what I needed to know or where I was going to go with what I was learning and I just was eager to learn everything and anything I could about aircraft. And a lot of things were very difficult for me because they were not things that I’d ever messed around with. When I studied aircraft engines, I wasn't like the guys who had tinkered around with their cars. I had never tinkered around; my Dad didn’t even have a car. So it was, it was all new but terribly interesting and exciting to me and I was really thrilled just to be there. KW: Yeah, well, that’s great. Listen to Patricia describe the challenges she feels were the most significant for her to overcome. KW:	Also just looking back, do any major challenges in your life come to mind that you feel really proud that you overcame? Yeah, any challenges looking back that you feel...I mean it sounds like just paying for college, I was impressed by that. PP: Yeah, that was the first challenge, just getting started. I have sometimes thought about that and wondered if I would have had the nerve to do it if I had really understood what I was getting into. I was fixed on the goal and it was just like, "Well, what do I have to do? What’s the first thing I have to do?” and then it was, "What do I have to do to keep on doing this?" and it was just kind of like one foot in front of another to get across the desert (laughs). I did have some challenges and some tough moments. I remember one time I was just really about to give up. I was all out of money and my Dad had already said he wasn’t going to help me anymore. I went over to see my grandparents and my granddaddy asked me when I was going back to school and I said, “Well, I just don’t know. I don’t have any more money and classes start next week and I’m out of money,” and he said, "Well, how much do you need?" and l think it was $65. He got up from his chair, went into the bedroom, brought out (I kid you not) a sock (laughs) and pulled $65 out and gave it to me. So, I was able to keep going. But there always seemed to be a way to solve the problem somehow. Oh and then after, after I finally graduated and I finally got the job at North American, started earning money, worked for a year, got to my first vacation and came home to visit my family and tried to pay my Dad back the money that I’d borrowed from him, well he did not want it then. Listen to Patricia talk about the job she had in her dorm and the one after she graduated working at Willow Run. PP:	Well, in college I started out working in the girls’ dorm. When Hank and I married, then we got an apartment, so I moved out of dorm and then I got a job out at the research center out at Willow Run. I don’t know if they still have that out there. But I was working for a very interesting graduate student named Kip Seigel and he had me working on stuff like computing rocket trajectories and it was stuff that was interesting for me. And he liked to tease me and tweak me and give me problems he didn’t think I could solve. And I was very good at math and I would figure out how to solve them and he would think, "Well, you don’t have the math background to do that,” you know like "How can you get the right answer?" (laughs). And that was fun. But he became...he had his fifteen minutes of fame I guess you might say. He supposedly developed a method of cold fusion back in probably the '60s and he got investigated by Congress and they were trying to decide if he really had something there or if he was just a phony. While he was undergoing this investigation by Congress, he had an aneurism, I believe, and died. I was sorry to hear that and I didn’t ever hear conclusively if they decided he really had developed cold fusion. He was really brilliant guy but came to a sad end. But I worked for him for a couple years and then before I married I would be home in the summertime and there was a company in the little town where I grew up, Sturgis, they would always give me a summer job. They were into helping college students by giving them summer jobs. And that’s where I had worked when I stayed out a year to make up for my trip to Texas. KW:	What year did you get married? PP:	We married in January of 1949. KW:	And then you graduated in 1950, is that correct? PP:	Right, a year later we graduated. KW:	Your husband was doing engineering as well? PP:	Right. He was in mechanical engineering. He was interested in going into sales, which he did. Listen to Patricia describe her experience working for North American Aviation where she started as a file clerk. KW:	What kind of jobs then did you have when you graduated? PP:	Well, I got a job at North American as an aerodynamics engineer. KW:	What was that like? On the survey I noticed that you had written that they didn’t want to hire a woman but they gave you a chance because you offered to do some filing for them. PP:	What it was, they had had a WASP from, you know, World War II Women’s Air Service Patrol member who had worked in their group and had...she wasn’t an engineer but she did the filing and the computing and she certainly knew aircraft and she was just sort of the helper in that group. So, she left and went back into the service and I had been out there applying for a job and gotten turned down there like every place else. Then they could just say, “Well we don’t want to hire a woman because you’ll quit and get married," and since I was already married, “You'll have a baby and quit." But anyhow they had excuses for not hiring women and they weren’t restricted from just coming out with it. But anyhow when she left the group they called me back and explained what she had been doing and said, “Would you be willing to come and take her job?”. And I said “Sure"; all I wanted was a foot in the door (laughs). So, I gladly accepted and I started in and in the beginning I was doing all the filing for the group and whatever but I kept getting bigger chunks of people’s jobs. You know they would turn over a little bit of something to me to work on and I was pretty smart; I was very good in math, and I behaved myself so I just kept getting bigger and bigger jobs until finally they decided I was fully qualified as an engineer and they made everybody do their own filing, forget my doing everybody’s dirty work for them (laughs). I was there for four years and then I finally did have a baby and quit. I didn’t intend to, I was just going to take a leave of absence and then get a housekeeper and go back to work, but two things happened. Number one, after I had the baby, although I had no experience taking care of babies, I’d never done much babysitting as a kid, never been interested in having kids, but just to please my husband "Oh, I’ll have one" (laughs) and then all of a sudden I was the instant expert and no one but me would know how to raise that kid, so I kind of lost interest in going back to work and then on top of that my husband was promoted to another job, which involved our moving from the L.A. area up to the San Francisco Bay area. So, that kind of settled that. KW:	Was it at North American Aviation that you had worked as a flight test engineer for the unmanned vehicle program or was that later? PP:	That was later when I went to work for the Navy. KW:	Okay. So, you only had one child then? PP:	Oh no. I had two more with Hank and then after he died I remarried and we had two more. Listen to Patricia describe her experience working for the Navy at Point Mugu as a flight test engineer for an unmanned air vehicle. KW:	So, you ended up going back to work then eventually? PP:	Yeah. I went back to work in late '79 but I was working locally for the first four years I went back to work and then I get the offer from the Navy down at Point Mugu and so I snapped that up and then I worked for seventeen and a half years for the Navy at Point Mugu. That’s when I got into the flight test engineer position for the unmanned air vehicle. KW:	You had also written on the survey under your most important accomplishment, you said “flying chase with Burt Rutan” and I didn’t know exactly what that meant. I was wondering if you could explain that to me. PP:	Oh that was just something really fun. The joint services were looking for an unmanned air vehicle and before they decided on the Predator, I went around and looked at some other unmanned air vehicles and one place I went was Burt Rutan’s place out in the Antelope Valley and flew chase with him, observing his entry into the competition. And if you’re not into aircraft, the name Burt Rutan probably doesn’t mean anything, but he’s a real hot designer and he got involved in the spacecraft, commercial spacecraft, to put someone into space without going through all the armed services stuff. I thought it was really a treat for me to be able to get in the aircraft with Burt Rutan and follow his unmanned air vehicle. But that was not the one that was chosen. It was General Atomic’s entry, which is the Predator, and it has since accomplished a lot over in Iraq. KW:	So, essentially you were at North American Aviation and then you stayed home to be with your children for awhile and then you went to the Navy, is that correct? PP:	Yeah, that’s pretty much it. KW: At the Navy, how were you treated as a woman? What was that like? PP:	You know, something that was kind of interesting to me and maybe this is a good time to tell this story. I realized after working for the Navy for oh, I don’t know, a couple of years, I realized that although there was a big gap in time between the time I left North American and the time I went to work for the Navy...there was like twenty-five years in there and I was twenty-five years older and twenty-five pounds heavier and I wasn’t that cute, young chick anymore...but I had the same kind of relationships with the guys I worked with that I’d had back at North American and I felt kind of good about that. I felt accepted and like a valued asset and I was happy to be there and happy to have that feeling of acceptance. KW:	That’s great. So, it kind of moved from in college when it was more just tolerance and being ignored to actually feeling like people want you there. PP:	Yeah, and that is true too. When I went to North American, it was very hard for a woman to get a job in engineering. But when I went to work at Point Mugu the person who introduced me, who sent in my resume there, got a bonus because I was a woman. They were particularly looking for women. I thought that was kind of a kick that they had changed so drastically in that twenty-five years. A lot of things happened. And I met more women in engineering. Still not a lot. I was surprised there weren’t more but the ones that I did meet would usually get around to the story of how someone had encouraged them in school or promoted them or got them interested in it. I heard that story so many times: “Oh I had this teacher who says I should go on and do this...” and it was just so different from the way it had been when I went to school (laughs). KW:	Right, because you didn’t really have a mentor figure, is that correct? It was really yourself pursuing your own interests. Interesting. Listen to Patricia tell the story of how she met her second husband in Santa Barbara, California. KW:	So, when did you meet your second husband? PP:	After I came to Santa Barbara. We were living in Connecticut and he was working in New York City, my first husband, was working in New York City and he was killed in a plane crash coming home from a business trip. I didn’t want to stay in Connecticut. We had only lived there three years when he was killed. I loved it there and it was lovely and I had friends there but I really wanted to come back to California. I definitely did not want to go back to the L.A. area and I didn’t even want to go to the San Francisco area because a lot of my friends from the San Francisco area were with the same company that my husband had been with and had been transferred down to the L.A. area. They were kind of moving people around and changing their method of operation. So, I just decided well Santa Barbara is in-between and that’s a lovely town and I why don’t I go there. So, I did. I’ve never been sorry. I love it here, it’s beautiful. And it just happens that my second husband also worked for the same company my first husband did and he knew my first husband although we had never met. And he had been working out of the L.A. office and just about the same time that I moved here he was transferred from the L.A. area up to the North County here, so he was going to operate out of Santa Barbara. We met at a mutual friend’s home and he was just kind of a lonely bachelor. He didn’t know what to do or where to go or how to act (laughs) and so he started coming over to my house and hanging around and by that time I had three little ones and I thought it was kind of nice to have him come by and play with my kids and I’d feed him (laughs). Then he started taking me out and pretty soon I don’t know, I guess the inevitable happened (laughs). Listen to Patricia discuss her decision to enroll in graduate school in the 1970s so she and her husband could found a Montessori school. KW:	I forgot to ask you one thing: you went to grad school, is that correct, during the '70s? PP:	Yeah, out here at UCSB, that’s sort of another tack there. After Chuck and I had our second child he got dumped by Johns-Manville, they were having to cut back, things weren’t going well, and they’ve really gone downhill. I guess they disappeared actually. So, they let him go. And while we were sort of floundering around and wondering what to do; we had our daughter in Montessori school here and I was always a strong admirer of Montessori and got the bright idea, "Why don’t we start a Montessori school?". So, we struggled with that for a few years before we gave up and decided this is not a winning proposition. But in the meantime people wondered what the two of us were doing trying to run a school because I had an engineering degree, he had a business degree, what do we know about education? So, to get a little credibility I signed up for grad school UCSB in the graduate school of education. I spent about three years out there in the Ph.D. program before I realized I did not really want to teach, so I took my master’s and left (laughs). It was fun though, I had a good time. KW:	And you had written on your survey that while you were there you were part of a group that was encouraging older women to return to school, is that correct? PP:	Yeah, actually it was just...I was just sort of a name and a phone number, someone to call because they were starting to encourage women to go back to school, women who had quit before they got their degrees or who had really wanted to go to grad school but their families had intervened. So, I was just someone to call. The thing that struck me over and over, the question everybody asked was "How did you get your husband to let you go back to school?" and I was just dumbfounded. Never occurred to me to ask him if I could go back (laughs). I said, "I’m going back.” But I have found that, I know there was back in the '70s or whatever, there was all this talk about equal opportunity and equal rights and all that stuff and it seemed to me that so many women seemed to need permission to do whatever it is they want to do and I don’t really understand that. As I think I mentioned, I figured out pretty young that it's better to ask forgiveness than permission. And when you want to do something you go for it. You go do it. You don’t wait for somebody to say, “Oh yes, you can do that." Listen to Patricia describe her children’s careers. KW:	I wanted to ask you, if you don’t mind, what do your children do now, just out of curiousity? PP:	They're all different (laughs). The oldest one loved music and pursued a career in music because I said, “Do what you love." Well, he found that as much as he loved it and as good as he was, very talented, it’s hard to make living and support a family that way, so he has gotten more business-oriented because he couldn’t make a living in music. My second son was very, all my kids were good in math, I think it’s genetic in our family, and he has degrees in business and economies and his last career was in the mortgage business, which is not doing real well right now. But he did well enough in real estate and in the mortgage business that he’s pretty well fixed if he never goes back to work again. He is still working, he’s still working at it but he’s not really dependent on it for a living. My daughter, my first daughter died in infancy. But my second daughter still lives with us and she makes jewelry, which she sells in various local establishments up and down the coast and also helps out her friends who have stores, places where she has the jewelry, she will go in and help out when they want to go on vacation or something. And she likes the fashion industry. She was a swimsuit model for awhile and got to travel the world and enjoyed that. My youngest son, I think, would have been the best engineer in the family if he had just been willing to go to school but he was dyslexic, hated to read, forget school. He took courses at the city college in electronics and he’s the chief installer, troubleshooter for a fire and burglar alarm company up in Bellingham, Washington. They have a nice home up there, they just a year ago had their first child. He's doing very well, enjoying what he’s doing and I guess he’s considered the best installer and troubleshooter for miles around. He's very smart, would have been a great engineer. 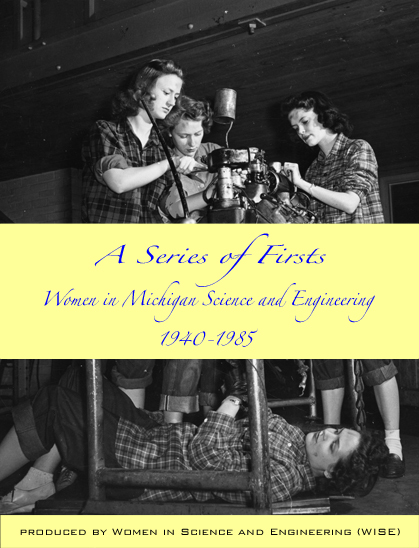 Listen to Patricia discuss the technological changes in engineering from slide rules to computers. KW: I guess just two final things. One thing that you had written down is that you found it really interesting how much things have changed from when you were using a slide rule to nowadays when everyone has laptops. I was just wondering if you could comment a bit on that. What have the changes been like for you? PP:	When I went to work at North American they didn’t have any computers yet. They had, for people who had to do a lot of computing or real accurate computing, they had Marchant calculators on the desk. But we all just used our slide rules and if we had something that really needed high powered calculations, we’d give it to one of the computers. They were people then (laughs)! But while I was there they installed their first Eniac, which was a fairly large room to hold this computer and it was temperature and humidity controlled, this thing was full of tubes. And they'd have punch card guys that would punch the cards and run them through the computer. And it didn’t do as much as your little pocket calculator does now but it was pretty big stuff then and we felt pretty privileged to have this at our disposal. Then when I went to work at Mugu in 1984 pretty much every group had a computer, a computer that was shared by like fifteen or twenty people. By the time I left we all had our own laptops that we carried around with us and took on trips (laughs). It was really an interesting progression. I know there were no guys my age at Mugu because most of them had all quit when they brought in the computers because they didn’t want to learn computers, it was just too much. But I had already been learning gradually along the way. KW:	Kids today in engineering must seem spoiled with their graphing calculators that can do all this stuff for them. PP:	I know (laughs). And I just recently got a new cell phone that’s very different from the old cell phone I’ve been carrying for years and I have to wait for my granddaughter to come over to show me how to use it. PP:	I had a boss at Mugu who was about the age of one of my sons and he was really into all of the high-tech stuff and all the gadgets and every time he’d get a new cell phone or a new laptop he’d get one for me. He’d think I ought to have the same as he did, which was very sweet of him, but I got so tired of having to learn (laughs) another computer, another cell phone. I really did get tired of it. I guess that's what happens after you get old, your brain gets tired. You want to stick with the stuff you know. 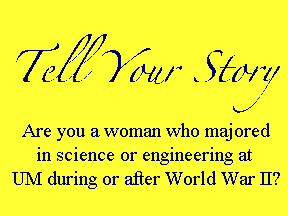 Listen to Patricia’s advice for young women pursing math, science, and engineering. KW:	Well, I guess just a couple final questions. Your last response might partially answer this question but I just wanted to ask you what sort of advice would you offer to women who are interested in pursuing math, science, those kinds of fields? PP:	Well, I guess...I think we should all follow what interests us. I know with my own children I always tried to expose them to as many different things as I could and then encourage them to pursue what they were interested in. I think that’s just the right way to live. Find what you like and...I don't really understand, I guess, a lot of the kids I know now that don’t know what they want to do. I was just never there. I always knew what I wanted to do. But I realize that not everyone does and I don’t know...all I can say is try everything you can and see what really sticks. 1. 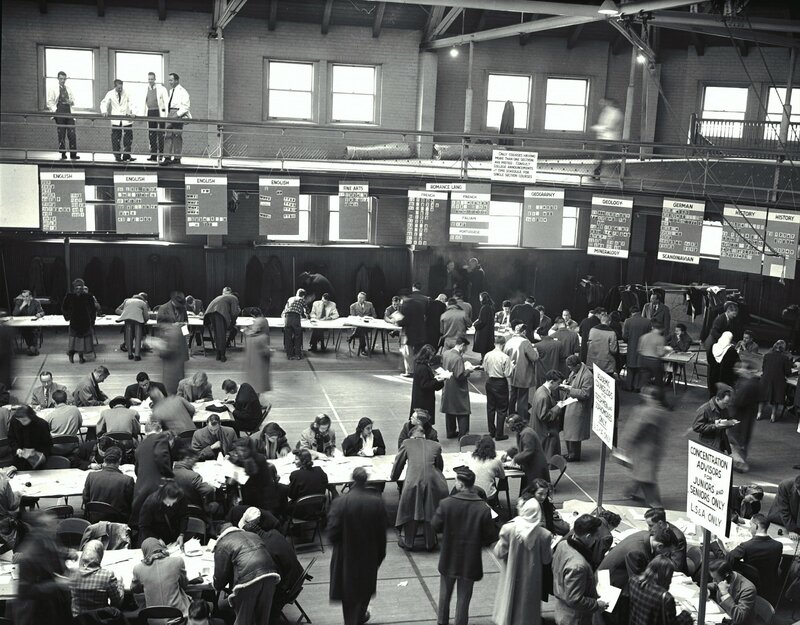 Registration in Waterman Gym, 1951, “Registration-6”, Box A-9, News and Information Services (University of Michigan), Bentley Historical Library, University of Michigan.